These highly acclaimed world-renowned Bressingham Gardens are a mecca for anyone interested in gardening, with many recent visitors claiming they are the best they have seen. The Bressingham Dell Garden has just passed its 60th anniversary since it was created by Alan Bloom from 1953. 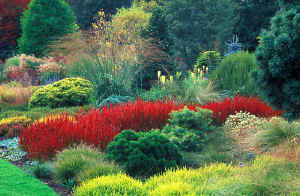 Famous for its Island Beds of perennials, it is now looked after by his son-in-law Jamie Blake. 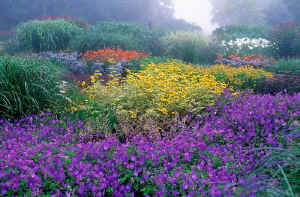 In 1967, Alan’s son Adrian began a completely different garden nearby, Foggy Bottom, which became equally renowned for its year round interest, and from 2000 Adrian has added Adrian’s Wood, The Summer Garden, The Winter Garden and The Fragrant Garden, creating a total of 17 acres with 8,000 species and varieties of plants which blend and flow between sweeping grass pathways. 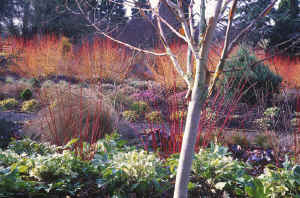 New plantings and great combinations, including flowing rivers of spectacular plants, make this a special place to get ideas and inspiration. 2019 – Open from 12 February - see website for details of opening times during the year. If you want to find places to stay near to Bressingham Gardens, why not stay in one of our recommended hotels. Each hotel has genuine guest reviews enabling you to book from anywhere in the world in total confidence. Bressingham Gardens hotels nearby - click here.